Poeme is so excited to now carry Young America Creative art prints! Choose from a variety of colors including ebony, cork, and green. Each poster is 13" x 19" foil pressed. Young America Creative is a multidisciplinary design studio led by Meghan Dorrian & Brian Friel. We believe design is the process of discovery, guided by the parameters of material integrity, environmental responsibility, client inspiration and the partnership with artisan craftspeople. YAC has developed an architectural path inspired by sustainability, craftsmanship and the collaborative exploration of making. The California Native Wildflower Poster features 150 native species as they bloom each month. The poster features both prolific, common and rare species that are native specifically to the Central Coast / Bay Area. Approximate radius of the listed species is centered on San Francisco, extending North through Marin County, South through Santa Cruz County and Diablo Mountain as the eastern border. Many of these species are found up and down the length of the west coast. Some species listed are rare, endangered, or poisonous. For example the Tiburon Mariposa Lily, Calochortus tiburonensis, is a listed threatened species, endemic to California and only seen on one NE facing hill in Tiburon, California. We heavily relied on the Calflora database to produce the data on this poster. The newest addition to the seasonal based poster series, illustrates the North Pacific Whales and their migration. 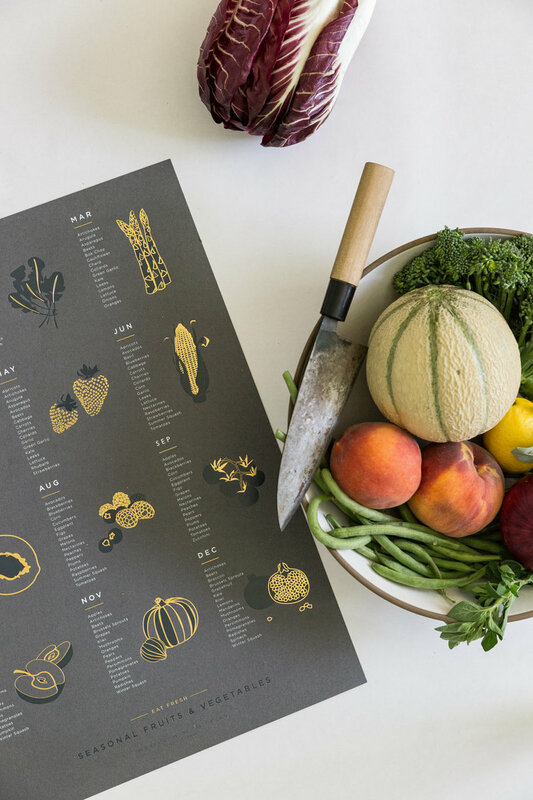 The seasonal fruit and vegetable poster features a monthly list of 15-20 varieties of produce that are freshest, ripest, and harvested within the listed month. These are the fruits and veggies found each month at a farmers market and are more likely to be locally grown and freshly harvested. The data is based of a central Californian climate / latitude 38 / coastal mediterranean climate. We are indebted to Toby of Free Spirit Farms for his farmer knowledge in producing the lists. Call or stop in to check availability and see what else is in store!